In the sweeping- much deserved- Caribbean and T&T euphoria of the Tessane Chin ‘The Voice’ win I couldn’t help but notice we Trinis again don’t seem to generate the same machinery and fuel for our own. Bunji’s and Anya’s voting storms notwithstanding. We need as a nation to connect the dots more often and more scientifically when it comes to our champions. We need to claim our talents and Genius and we need to make noise about them. This post is an attempt to put into perspective the amount of achievements that T&T nationals and diaspora massive put on the international map in 2013. It is an impressive list- and it is far from complete. And it is interactive because I want you all to contribute!!! one gold and four bronze medals at the Berlin, Netherlands and Moscow legs of the World Cup. joined judging panel of the twelfth season of American Idol with a salary of $12 million. has confirmed plans to launch her own record label, having signed Parker Ighile, Brinx, and Keisha as artists, and Blackout Movement as a producer. led nominations for rap musicians at the Billboard Music Awards 2013 having seven nominations. Won Best Female Hip-Hop Artist at the BET Awards 2013, making history as the first female rapper to win the award four times consecutively. currently working on her third studio album which is scheduled for a 2014 release. In April 2013, the limited version Pink Friday Special Edition fragrance was launched. In July 2013, Minaj announced that her second fragrance Minajesty would be released in September 2013. In September 2013, London revealed that the new album Vibezz is dedicated to his aunt who had passed away recently. In February 2013, Major Lazer signed with indie record label Secretly Canadian. released album Free the Universe. 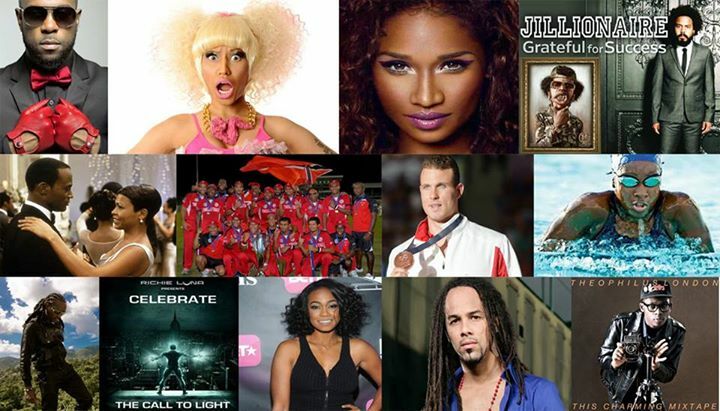 Posted on December 27, 2013, in President's Blog and tagged 2013 list, Bunji Garlin, Caribbean, international accomplishments, Nicki Minaj, trinidad and tobago. Bookmark the permalink. 20 Comments. According to Downbeat Magazine “Charles delivers his ebullient improvisations with the elegance of a world-class ballet dancer.” Etienne has received critical acclaim for his exciting performances, thrilling compositions and knack for connecting with audiences worldwide. In 2012, Etienne was written into the US Congressional Record for his musical contributions to Trinidad & Tobago and the World. In 2006 he won the National Trumpet Competition Jazz Division in Fairfax, VA.
origin, Etienne brings a careful study of myriad rhythms from the French, Spanish, English and Dutch speaking Caribbean to the table. Crucially, as a soloist, he fully understands the New Orleans trumpet tradition (which is readily discernible in his trademark instrumental swagger) and what famed Crescent City Pianist, Jelly Roll Morton so succinctly captured in the now immortal phrase, ‘The Spanish Tinge’. He has performed and or recorded with Monty Alexander, Roberta Flack, Frank Foster, Ralph MacDonald, Johnny Mandel, Wynton Marsalis, Marcus Roberts, Maria Schneider, Count Basie Orchestra, Eric Reed, Lord Blakie, David Rudder and many others. His latest recording, Kaiso (Culture Shock Music 2011), features his arrangements and interpretations of the music of calypso legends Lord Kitchener, Mighty Sparrow & Roaring Lion. Etienne Charles currently serves as Assistant Professor of Jazz Studies at Michigan State University. He holds a Master’s degree from the Juilliard School and a Bachelor’s degree from Florida State University. God Loves The Fighter – first ever T&T feature film to be featured in The Hollywood Reporter by Writer of the Year (2013) Stephen Galloway and Variety Magazine in 2013. Also won, Best Local Feature at the Trinidad and Tobago Film Festival 2013. Film was directed by Damian Marcano – born in T&T lives and works out of LA. JUS NOW is the meeting of two Riddim obsessives, Interface (Producer / DJ from Bristol, UK) and LAZAbeam (Percussionist / Producer from Trinidad). Pushing boundaries with the fusion of traditional Caribbean rhythm culture and sub heavy production values of the UK underground, their respective hometowns are separated by 4,500 miles, yet through a shared love of bass, rum and partying, JUS NOW are smashing up dancefloors across continents. Carnival season in Trinidad has seen the most notable collaboration with Soca superstar Bunji Garlin to produce road anthem ‘Savage’, whilst the UK has been exposed to sound of ‘Tun Up’, also featuring Garlin. ‘Tun Up’ has received heavy support from both BBC Radio 1 and 1Xtra as well as big name DJs, with Toddla T, David Rodigan, Shy FX, Baauer, MistaJam and B. Traits all giving signals. After acclaimed performances at Glastonbury Festival, Love Saves The Day and Bristol’s St. Paul’s Carnival – JUS NOW’s stage show continues to engulf every audience it’s presented to through infectious crowd participation. Complete with live drums and dancers, the host MC’s; Serocee from the UK as well as JUS NOW’s own Kerwin Prescott from Trinidad, provide a positive and extremely energetic front. Delon Anthony Armitage (born 15 December 1983) is a rugby union footballer who plays at wing or fullback for Toulon and England. He was responsible for the try that gave his team their pip-squeak 16-15 Heineken Cup final victory over Clermont Auvergne that made them Champions of Europe in 2013..He was born in San Fernando, Trinidad. He also occasionally plays centre and often does place kicking, mainly from a distance or if the regular kicker is unable to take it. From 1996 to 2002, Armitage lived in Roquefort-les-Pins on the French Riviera and from the age of 12 Armitage began playing for Rugby Nice Côte d’Azur Université-Racing. Armitage was rejected by the France Under-16s, who claimed he was too tall and skinny On his return to London, Armitage joined Richmond before his current club, London Irish offered him a professional apprenticeship. Armitage joined the Academy in 2002, where he played for the England U19’s and was involved in the team that won the U19’s National Cup (02-03). From there he progressed to the U21 squad. His talent was recognised and Armitage played for England in the IRB World Sevens tournament 2005. In August 2009 he took part in the Middlesex Sevens tournament in Twickenham where he helped London Irish to victory over Samerai International to take the championship. In May 2013 he scored Toulon’s only try of the match as they won the 2013 Heineken Cup Final by 16-15 against Clermont Auvergne. On 8 November 2008 Armitage made his full England debut against the Pacific Islanders at fullback following injuries to Mathew Tait andNick Abendanon. He put in a man of the match winning performance setting up a try for winger Paul Sackey English Rugby legend and team manager Martin Johnson described Armitage’s debut performance as outstanding. On 3 February 2009, Armitage and his brother,Steffon Armitage, were both named in England’s starting XV to take on Italy in the opening game of the 2009 Six Nations. The ninth pair and the first time since Rory Underwood andTony Underwood stepped onto the field together in 1995 that two brothers have played in the same England team. Armitage’s stepfather John played rugby for Hatfield and encouraged his sons to such an extent that four of them are now professional players. Guy plays at Irish. Steffon is also a member of the Saxons squad and Toulon. Bevon left RFU Championship club Doncaster Knights in 2010 for his brothers’ youth club Rugby Nice Côte d’Azur Université-Racing. Armitage is the first native West Indian to play rugby union for England. He has two children with his current girlfriend, a son Cameron (born 2007) and a daughter Chloe (born May 2009). Keston K. Perry, Doctoral Researcher at SOAS, University of London and founder of KUMBAConnect wins the 2013 World ITU Young Innovators’ Competition. Dwayne Bravo also signed a huge endorsement deal with a Chinese Company.